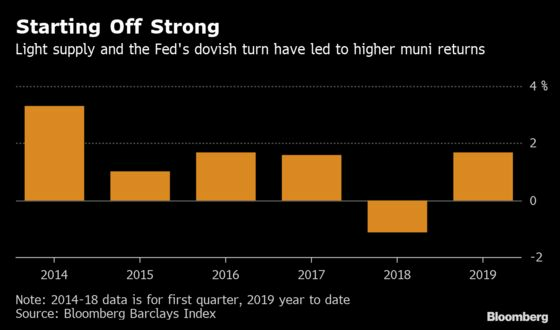 (Bloomberg) -- State and local-government bonds are headed for their strongest start to a year since 2014, propelled by an influx of cash into municipal-debt mutual funds as investors seek out tax havens and the Federal Reserve holds off on interest-rate increases. The securities have returned 1.8 percent in 2019, putting them on track for the best first-quarter showing in five years. That’s roughly double the gain for Treasuries, according to Bloomberg Barclays indexes. The outperformance has been driven in part by a push among investors to cut their tax bills after the new limit on state and local deductions was ushered in, a trend that Bank of America Corp. analysts said they expect to continue. The Fed’s decision to step back from tightening monetary policy is also boosting fixed-income investments. Investors have added about $12.6 billion to municipal-bond mutual funds since early January, with about $1.6 billion sent in during the week ended March 13, the tenth straight weekly gain, according to Lipper US Fund Flows data. At the same time, the pace of new bond issuance hasn’t kept up with demand, analysts say, a factor that helped push the prices of top-rated 10-year bonds earlier this month to their highest against Treasuries since at least 2001.